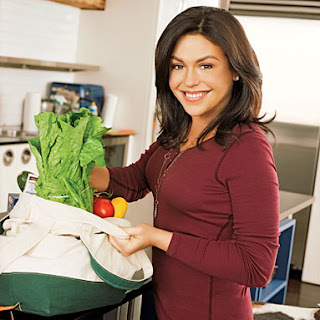 The Daily Breeze sat down with Rachael Ray for a quick interview while Rachael was on her way through Los Angeles promoting Just in Time. Here are a few of the highlights. "We shoot the equivalent of three one-hour episodes a day of "Rachel Ray" (in New York). I'm up at 7 a.m. and get home around 7 p.m. It's a long day but a lot of fun. When I'm on hiatus, we shoot "30 Minute Meals" and "Tasty Travels." We do out 285 shows/episodes a year between the three. While I'm on the road, I send pages (of the magazine) back and forth with comments - and I write columns and recipes on the computer whenever I have time. Everything I do for a living is what I'd do on a day off for a normal job. "Every book of mine I'd like to think is unique. The 15-minute meal started as a seven-minute meal stunt that was too fast for even me. The first day of the talk show (2006), I did a seven-minute meal for Diane Sawyer - and hacked off my finger doing it. It was too much, and I was a nervous wreck. It turned into 15-minute meals because seven was too short. This (book) is a collection of what everyone has seen from me in the last year, and I've built on those (recipes). " BLDs (meals you can eat for breakfast, lunch or dinner), MYOTO (make your own takeout meals), Date Nite Dinners (fancier feasts perfect for two) and The Kids Will Eat It meals. On whether she has a staff that helps develop recipes. "Never. I write every single one of the recipes and test (each) by making it on air. I have hundreds of opportunities to cook on air. It's easy to write my food in my head. I (also) write recipes before I send them over to the magazine. The magazine tests everybody's recipes." I could care less. If you eat well, you don't have to count calories. "I don't use any sort of garnish that isn't an edible (part) of the dish. Look for the food to be as pleasing to the eye as it is for the stomach. Taste is most important. I try to make people find their own happy zone for spices, etc. Develop your palate so a recipe becomes your own. I like heavy spices and herbs - and everything that I eat to have a lot of flavor. I use free-hand equivalents - and I also write that way, instead of spoons." I'm not surprised. She has fun doing what she's doing...talking with friends, communing with animals(even when they're not hers), cooking...that's standard RR. More power to her.